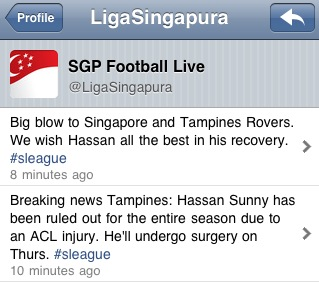 BoLASEPaKO.com - a simple view on Singapore Soccer: [BREAKING NEWS] Hassan out due to ACL!! [BREAKING NEWS] Hassan out due to ACL!! Got this shocking piece of news from the tweet timeline of my fellow blogger "LigaSingapura". The depicted graphic is self-explanatory. Please stay tuned for more update from LigaSingapura.